Mexican high relief tiles are handmade individually by the artisans. They use painting technique creating tri-dimensional cuerda seca pattern. Tile design is elevated high above its background. 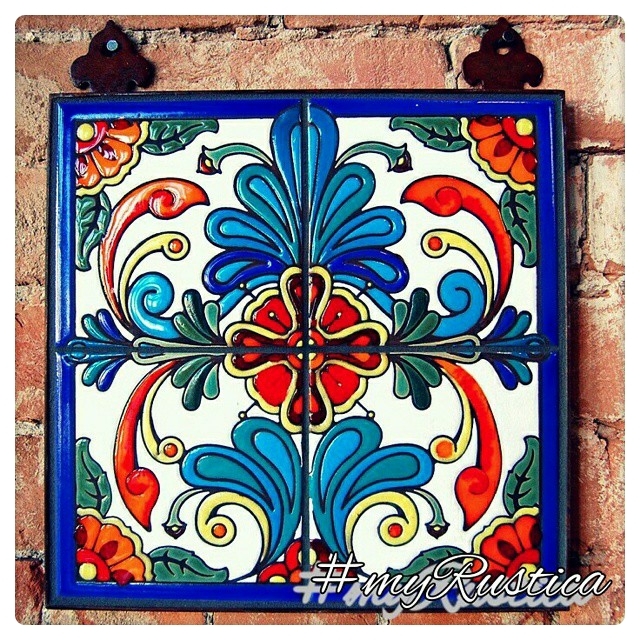 Relief tiles from Mexico are often used for kitchens backsplash, walls and fireplaces. Since they are glazed what makes them moisture resistant, the tiles with raised decor can be successfully used in bathrooms for counters and shower walls. The most common dimension of a relief tile sold today is 6x6 inches (15x15cm). The same style can be found among 4x4 and 2x2 as well. Often, high relief tiles are installed on stair risers indoors and in warmer climates outdoors. Indeed, decorative ceramic tiles look very pretty on foyer stairs. Just imagine your staircase decorated with relief tiles Mexico style adding southern character to the space. Even though the relief tiles belong to victorian rustic home decor category, they are very elegant with value-added component. Relief Tile "Beautiful Red Flower "
Relief Tile "Black Heart Border"
Relief Tile "Blue Cross Flordelisada"
Relief Tile "Blue Flower Border"
Relief Tile "Blue Green Flower Border"
Relief Tile "Blue Terracotta Lily Border"
Relief Tile "Blue Yellow Flower"
Relief Tile "Brown Blue Flower"
Relief Tile "Brown Blue Flowers"
Relief Tile "Brown White Flower"